We have all seen a cat eating grass. My lady cat does it all the time and she is invariably sick (on the carpet!) afterwards. This is in common with many cats. It should be noted that only a small amount of grass is eaten. Full-time indoor cats sometimes eat houseplants as a substitute. This can be dangerous as some plants are poisonous to cats as we know. Some are safe, however. There is no doubt that cats have an inherited instinct to eat grass; vegetation might be a more accurate description. This has prompted experts to speculate that cats eat grass to make themselves sick to bring up hairballs or other indigestible objects that are part of their prey. I think the above theories are incorrect. The real reason came to me from two sources. 1. First, I learnt that the snow leopard is the only cat wild or domestic that deliberately consumes a relatively large amount vegetation – much more that we observe in domestic cats (the cat that eats vegetation). The beautiful snow leopard lives in the high mountain regions of central Asia – see snow leopard range. They live 9-20,000 feet, above the tree line and in rocky areas. The air can be thin. 2. Secondly, when we see our domestic cat eating grass we see him or her chewing on it. It seems that they are extracting the juice. The juice in grass contains a vitamin called folic acid. This vitamin plays an important role in the production of haemoglobin. A deficiency of folic acid in a cat can cause feline anemia1. Red blood cells contain hemoglobin, which contains iron. It transports oxygen around the body in the bloodstream. We can see a connection between 1 and 2 above. The snow leopard needs to maximise the level of oxygen in its blood at high altitude. This it achieves through the ingestion of vegetation by boosting its production of hemoglobin. I conclude therefore that Dr Morris is correct – a cat eating grass is doing it to improve its oxygen carrying capacity and to improve health through ingesting folic acid. For all those full-time indoor cats in the United States there are products that can substitute for a cat’s walk in the garden for a nibble of grass. Indeed one is a total substitute – a tube of some sort of paste. However, this product, which is one of the products featured in the Amazon carousel below, is based on the theory that cats eat grass to throw up hairballs and I have just disproved that (I believe). The other products include a Chia cat grass planter and cat grass seed. All provide edible cat grass. From cat eating grass to Cat Health Problems. 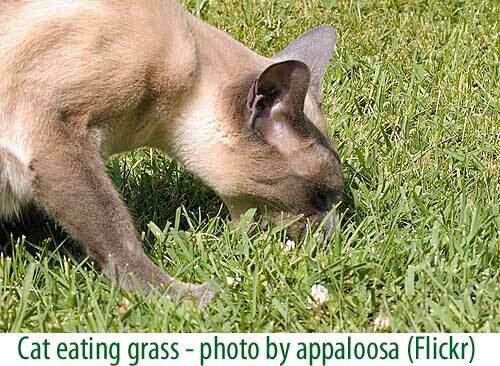 This entry was posted in Cat Behavior and tagged cat behavior, cat eating grass by Michael Broad. Bookmark the permalink.